Finally I get to write about setting up a simple backup plan for your digital pictures. Last week I have written about the things that you need in order to be able to backup your pictures. So, assuming that you have an extra hard disk (internal or external) you can start backing up your digital pictures. In this article I will explain how I backup my pictures using SyncBack Freeware software. STEP 1. Download and install SyncBack software. I assume that you have already done so. If you haven’t done so, use the link at the end of the article. The install is very simple…no need for instructions on this one. The first thing you need to do after you start SyncBack is create a new backup profile. 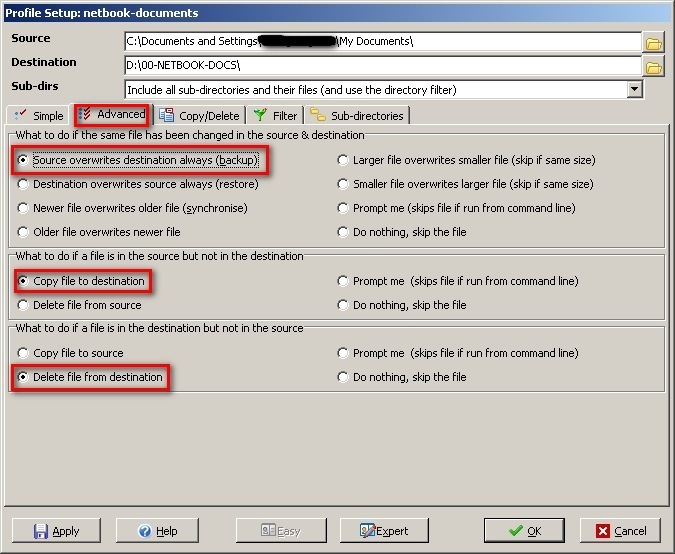 You can create many profiles for backing up different folder structures. For example, I have six profiles: Backup iTunes, Backup My Documents, Backup My Pictures, Restore iTunes, Restore My Documents and Restore My Pictures. Each profile holds the source and destination folders as well as the parameters that you have set. Parameters include: actions to take if source and destination are not in sync, filtering different types of files and many others. Just browse to your source folder and then to your destination folder. If you have an external hard drive, make sure it’s connected to your computer. If you’re backing up your pictures choose My Pictures on your main hard drive and then My Pictures on the destination hard drive. You can click on the Advanced tab if you want to filter certain things or schedule your backups and many, many other options. If you want your backup to completely mirror your main computer’s hard drive, then you should instruct SyncBack to delete any files in the destination folder that are not in the source folder. This way, if you erase a bunch of bad pictures on your computer they would be deleted from your backup as well. It is up to you what kind of backup you want: a true backup where you preserve any file you ever had on your computer, or a mirror backup where you preserve only what is currently on your computer. Personally, I choose the second option because I put in a lot of effort to clean up really bad pictures on my main computer, so I want that effort to be duplicated on the backup drive. STEP 5. Run the backup manually or automatically. Once the profile is set you will see it listed in the main window. Now you have a few options in terms as to what you can do with it. The simplest thing is to run it by double clicking it or right click on the profile and click Run (or you can just double click the profile). A feature that I also like is the Simulate, which shows you a list of what files will be copied before the operation is completed. Or setup an automatic schedule task. To do this RIGHT-CLICK your profile and choose Schedule, then dismiss the many popups you get from Windows informing you about the password policy. 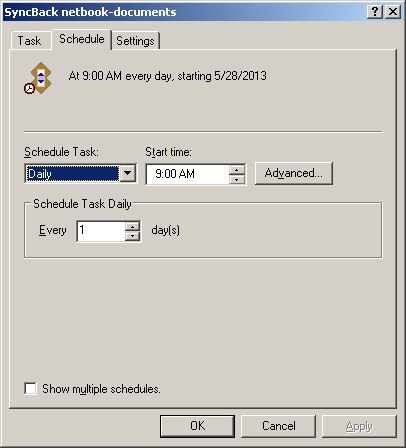 Eventually you get to the Windows Scheduler window where you can pick the date an time for the task to run. The key to backing up your pictures is to do it consistently. I setup my profile to run automatically every night at midnight so it picks up all my changes from the previous day. Doing it automatically makes everything so much easier. Western Digital Live Duo – Get the safety of the RAID architecture for a low price.